the full Match Results Details. This enthusiastic team exemplifies the essence of the competition through team buidling, cooperative team spirit, and gracious professionalism. This team could be seen helping many teams in the pits. Their ourtreach involves social media and extends the FTC spirit to other organizations, including a STEM Academy. This team was committed to spreading the importance of science and engineering to populations who did not have exposure to these fields. In doing so, they had to break down many barriers. Their 3-tier outreach plan leaves other teams green with envy. For Innovative use and re-purposing of approved build materials. This team effectively made a sticky belt from shelf liner material efficiently lifted, controlled and deposited blocks for maximized scoring. This team used CAD software to create a robot that is functional, elegant, and unique in its appearance. This team mapped out its strategy to get maximum end points and built a robot from diverse components, such as lego parts and rubber bands. This Quantum Physics oriented team equipped its robot with neon green lights to give it a futuristic, out of this world look! This team has machine-like dedication in recording their engineering progress in their notebook. With a small team size, their motors were going full speed to design and build a solid robot and outreach with their community. This team's engineering notebook is smokin' hot! This team was clearly EXCITED throughout the competition, as they cheered on their team and others. This team proved to be worthy candidates of this award by performing well in a number of categories! This team not only showed their engineering prowess with the performance of their robot and their excellent documnetation, but also demonstrated their committment to outreach by helping underprivileged students LAUNCH an interest in STEM. This team had an incredibly robust robotic solution that scored at the highest levels all day. They scored every time in the autonomous by finding the IR beacon and depositing the block into the correct basket. 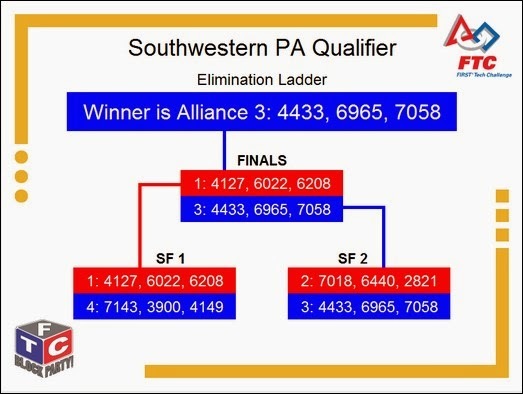 The winner of this Autonomous Programming Award has been determined. This Rookie team was created as a way for FLL graduates to continue their involvement in FIRST. This FTC team fills a gap in their FIRST Community by completing the full range of FIRST Programs. This teams goal is to spark an interest in the state for STEM.